When I first found out about the project Ru Trip Community a few months ago, their first release Ru Trip Community Vol.1 made me curious. After listening to RTC‘s second compilation – Imprints, I felt a bit scared. While in Vol.1 an unknown creature by the name of “Russian trip-hop” was sharpening its claws and trying out it’s little fangs, Imprints feature a beast that is able to rip anybody into desirable amount of pieces. Somebody would probably consider my rating of 8.5 a penal blasphemy (especially in comparison with the modest 6.5 for the new Tricky). Obviously, me and that somebody have very different rating criteria (thankfully, this blog belongs to me :)). The same somebody didn’t like me calling RTC’s leaders ‘heroes’. Well, I’m gonna call them ‘geniuses’ to top it off, and let them blush with embarrassment. Because the idea for the compilation – first part – original songs, the second – remixes of those songs by the participating artists, – is ingenious. You can play around with Imprints however you like – you can listen all the originals first and then all the remixes, you can listen to an original and its remix back to back, or you can listen an original track by a band followed by the remix they did… Or you can do nothing of above and just kick back and listen and enjoy the whole thing. There’s so much solid and exciting material on the compilation that I’m not even gonna waste my time talking about less liked tracks because a) they aren’t too bad either, just, so to speak “not my cup of tea” and b) the much liked songs are the majority anyway. Remember in the review for Vol.1 I said that I’m not likely would want to seek out other music from most of the participants. The situation is directly opposite with Imprints – I would like to know better practically every artist on the compilation. KAVver.‘s intense and inventive track “Dusty Spring” makes a very strong opening for the compilation, setting the bar pretty high, which, luckily, never really gets lower. “For My Brother” by coldreavers – an excellent instrumental composition (which I probably liked the most among the original tracks), which in a strange way combines uneasy and melancholic atmosphere with tremulant profoundness. KBC pres Mariachi in “Too Old Memoirs” lays heady saxophone on the impeccable downtempo beat, вБЕНЗИНЕестьОБЛАКА (“thereareCLOUDSinGASOLINE”) with their “Cray Piano Experience” raises the question “what is trip-hop, really?” to which POLI.ANT gives a very comprehensive and conclusive answer with the sullen (in a good way) “Scrible Zero”. Instrumental tracks are dominating on the compilation taking up about a half of the album (the second half is shared by the representatives of abstract hip-hop and female vocals, including Stemvelta with the excellent “Windowsight Scares Me” which I had the pleasure of listening before), and I personally find it a good aspect that helps breaking the language barrier. Which, sadly, makes projects like Поводки Нетерпения (“Leashes Of Impatience”) hard to digest for a non-Russian speaking listener. Not that it lessens the quality of their work anyhow. “GSM” by Поводки Нетерпения is a wonderful song with every word occupying its designated spot (whatever that word means is another question), – vocals and melody are in inseparable harmony. And their remix of aforementioned “Scrible Zero” is an independent piece that is equal in quality to the original. This was, as you may have noticed, a smooth transition to the second part of the compilation, which I enjoyed just as much as the first. And sometimes even more. Some artists found very interesting ways to rework other people’s material. Karizza performs a positively insane transformation of Melatonin‘s “Glory” (the original is pretty good as well, imbued with somewhat nostalgic atmosphere) and takes the top spot on my list of the album’s favorite tracks. And their original song “Женщина декаданса” (“A Woman Of Decadence”) gets a very cautious reworking from KBC pres Mariachi, which inserts a certain dose of sanity into the totally bonkers original (both things are good in their own way). Fetish Silence paints KAVver.‘s “Dusty Spring” in morose tones, Pandub Bear bares the hidden tenderness of My Automata‘s “Давай убежим” (“Let’s Run Away”), and they in their turn give “Too Old Memoirs” some gangster flavor. It’s impossible to reflect all the emotions, mention all the ups and downs in just one short review. Thankfully, the entire compilation (including a booklet with original artwork for every song) is available for free download from multiple sources. Download, listen, love it, hate it, share your opinions (with me as well!) 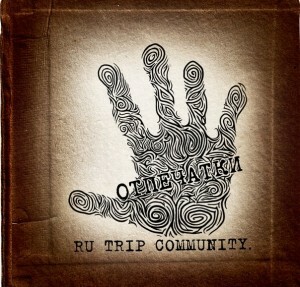 and, please, support Ru Trip Community and its members as much as you can. The only thing that kinda worries me – the level of Imprints is so high that it’s going to be difficult for the following release to live up to it. I guess we’ll see. Previous postMassive Attack – Atlas Air (video) Next postWhat trip-hop? !